This blog does contain affiliate links. This means if you buy something using one of our links we get a small referral fee. Like...its pennies usually. But we still do a happy dance for each one. Thank you for supporting SHE! Do you love all things Fall? I’m neutral, but my sister Heather goes crazy over anything pumpkin. She’s the one who has to smell all the pumpkin things in the store : ) Products with fall-inspired scents and ingredients such as pumpkin are so fun and festive, and they make her happy! But the chemicals in most seasonally inspired skincare and make-up don’t make either of us happy - or our skin, ultimately. The great news is that you can absolutely find cleaner, safer versions to let you celebrate the season and soak in all things Autumn! Here’s some of the clean favorites I found for Heather and that we both personally love. Seasonal happiness? Check! This mask combines pumpkin with fruit stem cells, vitamin C, and glycolic AHA blended with manuka honey to gently dissolve and sweep away dull, dry surface cells, exfoliate and resurface your skin, and banishes any scary dry skin! Do you turn most labels over and scratch your head if it’s safe? Just search the product in the EWG’s Skin Deep database and it ranks almost all beauty products based on how clean and safe they are. It makes finding clean products a snap - without researching all the chemicals on the label! Heather and I will search for products we are looking at right while we’re standing in the store! Thanks, EWG! Growing up, flavored chapstick or lip balms were a BIG treat, and today seasonally inspired flavors still make us feel young and festive! The organic beeswax and extra virgin olive oil Badger uses naturally seal in moisture, it free from artificial fragrances, dyes, parabens, petrolatum, GMOs, and synthetics….and even the label is fun fall colors. It's amazing how something so simple can make you happy in the middle of anything your day brings - but there’s science behind it too: citrus scents boost your immune system and your mood - something we all need around the shorter days and cold and flu season that coincides with the holidays! 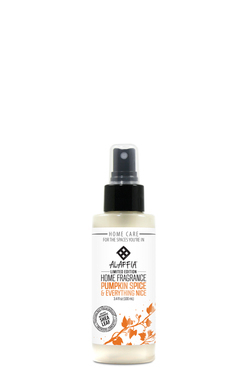 Alaffia’s hand & body crème, with warm, comforting and seasonal notes of pumpkin spice, offers deep penetrating hydration to leave your skin feeling smooth, nourished and protected - minus the chemicals! We’re fans of anything that has a frosting-like texture in the style of sweet & pureed pumpkin. Combine that with the seasonal scents of cinnamon, nutmeg, and clove, and it’s a truly festive experience you can soak in daily! This product isn’t skincare, but it’s too good not to share with you. Most deodorizers, room scents, and things like Glad Plug-Ins are a chemical bomb… but this spray will rejuvenate and energize the spaces you’re in with the scents of Fall without all the unwanted chemicals. It combines notes of pumpkin, nutmeg, clove,and creamy, sugary vanilla. Give it a shake, spray, and “fall” is instantly in the air! Of course you’ll love the fall-inspired use of pumpkin, but you’ll really love how this makes your skin feel. Because it turns out the pumpkin doesn’t just taste good in a pie, it’s actually packed with a lot of great nutrients for your skin! Pumpkin has fruit enzymes and alpha hydroxy acids (AHAs), which increase cell turnover, which brightens and smooths your skin. And it has antioxidant Vitamin A and Vitamin C to help soften and soothe your skin and boost collagen production to prevent the signs of aging! This blend is made without GMOs, Gluten, Parabens, Petroleum, Phthalates, Silicones, Sulfates, Ureas, Artificial Fragrances, and Artificial Colors. Enjoy! Those are a few of our Fall-inspired skincare favorites! If you have something you’re loving that isn’t listed here, comment below and share it with the SHE community! And if you have a friend who love pumpkin and Fall as much as Heather does, send this list to them for cleaner, safer inspiration!